I’ll admit it. I’m sort of a self-help fanatic. I’m always seeking ways to improve who I am as a person and I’ve been thinking about the ways that home design can help other people meet their personal goals. This is my first blog in a three-part series of how a well-designed room can transform your goals into reality. 1) Healthy habits are easier to instill when you associate them with a particular place and time. Find a place in your home that you know will be available to you at the same time each day. Along with any fitness equipment, think about dedicating a space for music or perhaps a TV, and a safe surface to place your water. 2) Worried about heavy equipment ruining your floor or carpet? 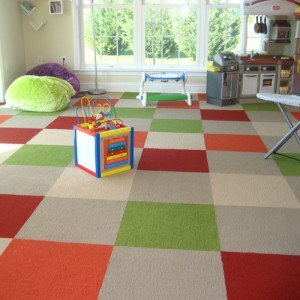 Try carpet squares from FLOR. If one gets stained or damaged you can just pull it up and replace it. 3) If your goal is burning calories, brighter colors on the wall are a good choice. Red is invigorating and stimulates the heart and mind, orange can boost your mood, while yellow can bring happiness. If those colors are too bold for you, you can use them as accents and balance them with calm grays or stable blacks or navy blues. 4) Are you looking for privacy in your exercise space? Maybe you will want darker curtains or blinds. 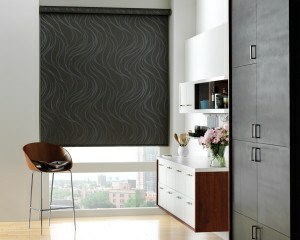 Hunter Douglas has introduced some new designer fabrics for roller shades, with hundreds of fabrics from sheer to opaque. Do you see yourself exercising with the morning sun? Natural light is a mood booster, so take advantage whenever you can. 5) If you plan to exercise in the evenings, you don’t want your space to remind you of a dungeon, so keep it bright. Be sure to avoid most fluorescent lighting though, so you don’t feel like you’re exercising at the office! Instead use LED lighting with lumens within the 3000-4500 range for soft, warm lighting. 6) Nobody wants to stare at a blank wall for 30 minutes (or more) each day. Find artworks that motivate you: an image of a favorite place to visit, or a painting or print with colors that speak to you. Visit Top Art for lots of choices, and just give me call if it gets too overwhelming to pick. Have you ever created a vision board? It’s a place to cut and paste pictures, quotes and other visuals to help you meet your goals. Place one where you can easily see it. I hope these ideas have gotten you thinking… and then exercising. For more ideas specific to your home, give me a call or leave a comment.